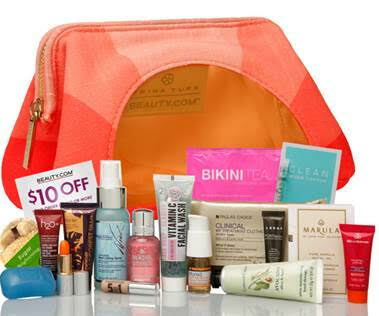 Beauty.com Summer Gift with Purchase — Trina Turk’s Sunset Cosmetic Pouch! With summer holidays just around the corner, Beauty.com, a division of drugstore.com, inc. is debuting the exclusive Sunset Cosmetic Pouch from esteemed designer Trina Turk as a complimentary gift with purchase. The product-filled pouch is available starting July 7th for customers spending more than $100 at the prestige online beauty retailer. Brightly clad with a translucent window on the front, this TSA-friendly bag is perfect for toting beauty essentials in hand. Shoppers can find the case at www.Beauty.com/TrinaTurk. “I’m constantly in awe of the vibrant colors and the incredible beauty of nature and wanted to make sure this pouch was just as bright as the collection that inspired it!” says designer Trina Turk. “It’s the perfect size for your essentials and easy to find in your handbag.” The pouch is adorned with the sunburst motif seen throughout Trina’s summer 2015 runway collection. The structured design allows the pouch to stand up straight in a perfect rectangle when the zipper is open – this allows maximum convenience when rooting through for product. These gifts with purchases from Beauty.com are amazing! You get a gorgeous bag fill with deluxe luxe product samples. Are you going to pick one up? Leave a comment and let me know! Next postDon’t Forget To Enter My Cetaphil Product Giveaway!